Gardens are constantly changing. 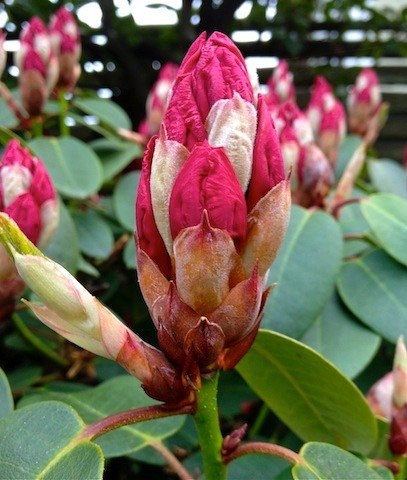 Think of watching a rhododendron bud swell and finally burst open on a sunny May afternoon or remembering a tall tree as a sapling, planted years ago in celebration of a new life or in memory of a loved one. This change is important factor when you’re planning a garden. Because different plants have different rates of growth, forecasting what a garden will look like two, five or 10 years from now is a vital part of landscape design. When choosing plants for a special condition, such as privacy screening, we need to decide how long we are willing to wait to achieve our goal. Factoring in the rate of growth and the mature size is helpful when determining what size specimen to start with. Spacing tiny plants according to what they will look like in 10 years seems practical, but it may take five years or more to achieve the intended result. That’s a long time to wait. For immediate impact, choose mature plants (if they can be found) or plant more densely. Keep in mind that in a couple years this may start to look overgrown and plants may suffer as they compete for light and nutrients. Pruning will help, but eventually some plants will need to be removed to keep the overall design healthy and looking good. That’s called gardening! Need some help with garden design? Contact me to begin your plan for summer and year-round. Connecting with nature has long been recognized as an important part of our well-being. It’s said that spending one hour outdoors every day is essential for a healthy mind and body. I agree. I don’t always achieve that at this time of year, but I sure notice how good I feel whenever I do. Near urban areas our gardens are our connection to nature. That’s true when we spend time outdoors but also when we’re inside, but looking out at the natural beauty that surrounds us. I recently visited a newly finished landscaping project I am especially excited about. It was a highly satisfying project, one that expanding my own understanding of how we connect to nature in an outdoor space. The Seattle-area project included an opportunity to collaborate with the architect of the house for a remodel of both the structure and the landscape. Giving input for the selection of interior finishes and design features, while designing the new landscape outside, helped me to create a seamless connection between the indoor and outdoor spaces. Corridors in the house are designed to lead to garden views, and a mini-terrace off the master bedroom overlooks a private corner of the back yard. The kitchen door serves as a side entrance and adjoins an herb garden that provides fresh flavors and smells all year round. As a result of these synergies you feel a connection outdoors, whether you are inside the house or actually out in the garden space. While a structural remodel might not be in your future, landscape design that is in strategic harmony with the architectural elements of your home can enhance the connection to your outdoor space. Optimizing small spaces as visual focal points can be done with simple container gardens. A water feature adds instant calm while masking any ambient noise. To create separation from close neighbors or municipal structure, use a trellis or arbor to create privacy and reduce visual impact. Beds of seasonal color outside a living room window remind us that summer will come again with time to actually go out and smell the moist earth, dig in the soil, plant the first seedlings and connect…if only for a few minutes. Want to bring your house closer in harmony with nature? Contact me to begin planning for next summer and a great outdoor room in which to enjoy it. I’ve always been intrigued by black flowers. Many varieties of black-flowering plants have flowers that are closer to intensely dark purple or aubergine. My interest in black flowers started with limited varieties of bearded iris and tulips. They had dramatic names like Anvil of Darkness, Queen of the Night, Onyx Odyssey and Black Magic. When I was a kid, I was really excited about planting my first bearded iris, named ‘Superstition’. I’d spotted in a catalogue, and persuaded my mother to order it for me. Because of its color, she (who liked traditional color palettes), considered it “gimmicky” — not be taken seriously. Black flowers make a statement. When designing a garden, the color black can be used much the same way that you use white. Black dominates other colors, so it can be a dramatic way to set off other flowers and plants. But black can also blend beautifully. Try it with dusty shades of grey (like Licorice Plant), the smokey blues of lavenders, and deep shades of yellow. Landscapes with black flowers make a statement. They can express the owner’s personality — and they don’t need to limit you. If you like change, different looks can be created by changing seasonal color or bulbs from year to year while keeping the black flowers constant. You employ black flowers in traditional or more edgy designs. Recently, I had a request for such a garden design on a tiny city lot with lots of potential. Black flowers looked right at home framed by the grid of the black powder-coated iron fence that I designed for the small entry courtyard. Black pots pulled the theme together, drawing out different colors and textures — especially shades of lime green against the leaves of Black Magic Elephants Ear (Colocasia esculanta ‘Black Magic’). In the Pacific Northwest, we are blessed with a seemingly endless palette of plants that thrive. The same good design principles always apply, but the color and composition of a garden can vary widely. Garden design is like a work of art — you never know exactly how it will turn out until it’s completed. Gardens are like living works of art that keep morphing and changing forever. Let your garden be a reflection of your own creativity and an inspiration to others! Don’t hesitate to try something new and different — your garden starts with your ideas, even ones that you might not immediately know how to put into words. About now the deciduous trees are coloring up nicely and the squirrels having been busy burying nuts (probably in your container gardens—just where you don’t want them) since last month. But, in my garden, it’s not officially fall until I can begin to plant spring-blooming bulbs. That’s usually about mid-October. That is the perfect time to integrate bulbs in to my designs for clients. Interesting bulbs are readily available from suppliers, and it’s easy to dig. I also like to sneak bulbs into potted gardens to provide an early spring surprise after a long winter. You’ll find a wide choice of bulbs to add color your spring garden. Snow drops (Galanthus) will bloom as early as late January and some varieties of tulips bloom as late as May. Allium finish blooming in June. 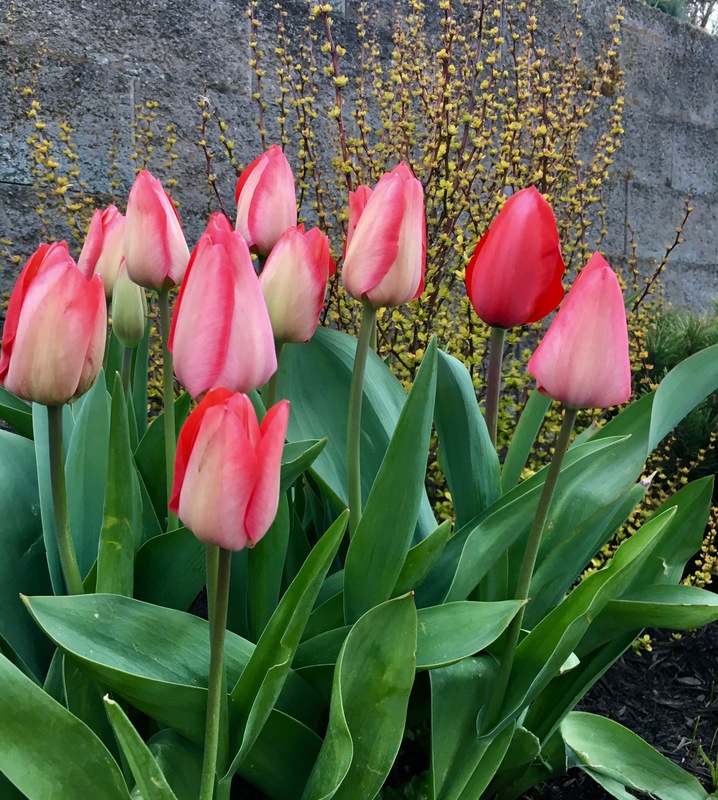 If you plan well, choosing the right bulbs to create a sequence, you can enjoy a non-stop show from late winter through spring. This is not hard to do. Because different species of bulbs need to be planted at different depths, you can easily plant multiple types of bulbs in layers, in the ground or in large pots. I look forward to seeing masses of crocus, daffodils and narcissus that have naturalized and grown into tight clumps that get fuller by the year. For smaller gardens, try planting clumps of like varieties and complimentary combinations with varying heights. For larger gardens, a drift of all one type of bulb—in a single color—is stunning. On hillsides or woodland gardens, bulbs can be planted in bands to suggest the flow of a stream or in other patterns, such as sequences or gradations of color. 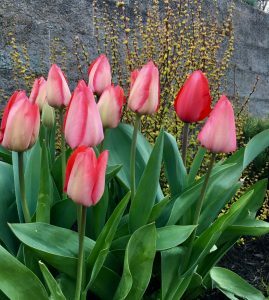 A cautionary note: Your bulbs will not do well in hard, compacted soil and will not tolerate muddy or saturated soil for any length of time. Some bulbs will do well in pots if the soil is light and the drainage is very good. Pots should be raised off surfaces with hidden feet or trivets to provide air circulation and drainage. I hope these tips help keep you motivated to be out in yard as the weather turns cool or at least inspire you to go to your favorite nursery to see what’s available. If you need help planning your fall garden or developing a comprehensive plan for your landscape, contact me for a design consultation. I’m always here to help and love to hear from you about your garden successes. Right now it’s hard to imagine that the super-saturated ground in the Seattle area will ever dry out. But it will, and quickly — remember last summer? It doesn’t take long once the dry season comes. And the last few years, we have even been surprised by some hot days early in the season. At the peak of summer, few gardens can get by without some supplemental watering (the exceptions being certain types of plants and trees that are very well established, or a rock garden). Let’s start by drought-proofing your lawn. Grass is an expensive ground cover, and if it’s not watered and maintained, it’s a brown eyesore for months. Think about replacing that lawn with a stepable ground cover or drought-tolerant succulents. Most are very easy to grow and many can also handle soggy Northwest winters. When looking at drought-tolerant plants for the garden, it’s easy to get bogged down in plant selection. Northwest native plants might sound like a good choice. They are already adapted to this climate and can survive a short dry spell. However, our yards aren’t much like the environments where these plants naturally occur, so there is no guarantee of success. And, sad to say, most native plants don’t offer much in the way of “eye candy” in the summer garden. If you are a purist and want a native plant garden, you will find a long list of easy-to-grow plants — just don’t demand too much of them in the way of appearance. If you add drought-tolerant plants that are non-natives into the mix, you’ll find there are a lot more possibilities. 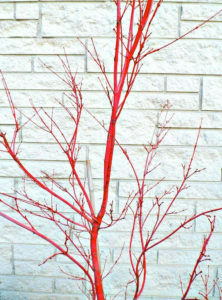 Colorful perennials, plants with interesting leaves, bark, and fall color are readily available. You can see examples of this type of garden, mixing native and non-native plants, in my online Portfolio. 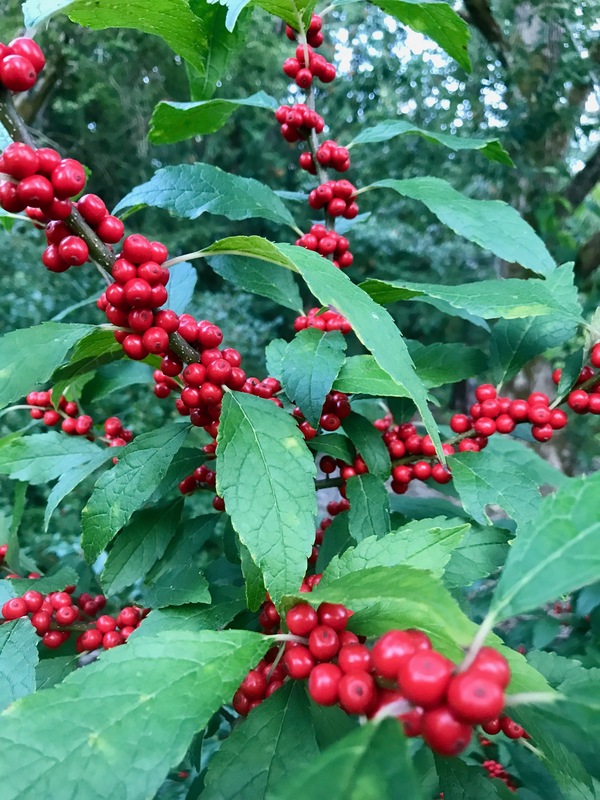 Previous Design Tips blog posts talk about my top picks for plants, shrubs, and trees that do well in the Pacific Northwest. Working with plants on a regular basis for years, I’ve learned what conditions they need to thrive in our region. This helps me decide what plants to use for any application — and, just as importantly, what plants not to use. Once the framework for a garden design starts to take shape, then plant selection is an important part of making the landscape work. That’s when considerations like ease of maintenance and drought tolerance come into play. 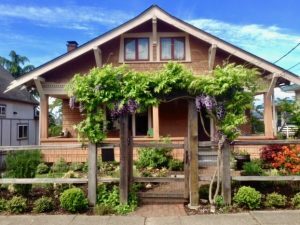 But keep in mind that there are many other criteria that influence what type of plants will thrive in your garden, especially in a sunny Northwest summer. Call us for a consultation to discuss garden enhancements, landscape renovations and sustainable gardens. Deciduous grasses are an uncommon seasonal hedge, certainly not a traditional one. During wintertime, we are more aware of hedges. Usually evergreen, they dominate the barren landscape when there’s not much else happening. The rest of the year they fade into the background, serving as backdrop for a more interesting garden display. Because hedges are usually repetitive and often made up of tightly formed geometric shapes, they create a green wall — especially in contrast with a garden that has a more natural feel. If you want to soften a hedge, choose plants with a more natural growth habit. For this, Myrica californica, Laurus noblis or even great perennial grasses need only some shaping and thinning to stay in check. Can a “hedge” be used as a landscape feature, not just a boundary? English gardens provide some of the best lessons in using a hedge as a feature. Hedges serve as the walls of an outdoor room. This can be very effective on a large piece of property, such as in estate. A hedged area can provide intimacy and “people scale” or it can be used to define and contain a perennial or vegetable garden. Low hedges (the obvious example being Buxus sempirvirens, the boxwood) will create a border to contain a garden bed and keep a clean edge and tidy appearance around otherwise floppy perennials, as well as provide structure in the winter. Only in Japanese gardens can one get away with pruning Azaleas into a hedge or mounded drift. Pruned carefully and at the right time of year, Azaleas are solidly covered by flowers and a quite stunning sight. However, taken out of context —outside a formal Japanese setting — too many Azaleas can be problematic. Keep in mind that your hedges do not have to be at the borders of the property. They can define space within a space, mark an entry or be juxtaposed with one another in modern planes creating an interesting interplay of light and shadow — think Stonehenge in England. How do you choose shrubs for a hedge? Before buying hedge plants, carefully consider the finished height and width you would like to obtain. Consider the site and growth rate along with the size the plants will achieve in ten years. Beware the conifer Cedrus leylandii — it is rarely used properly for hedges, and after a few years it turns into a monster that can no longer be pruned to size (plus it has dead growth at the base, just where you don’t want it). If you use it in the city, be prepared to remove and replant shrubs every several years. This plant is better off bordering a field or rolling estate lawn, where it can be allowed to grow without pruning. I advise spending a little more up front and buying a conifer that won’t grow so quickly. Taxus bacatta, commonly called a yew, is a good choice. It grows slowly, but its rich green foliage keeps a pleasing shape. Buy plants big, plant them closer together, and you’ll get the look and size you want without the bother of overgrowth later. I have designed both tiny gardens and estate gardens with hedges, and the principles of good design hold true for both. Contact us to talk about the best plant for your hedge and how to use hedges in innovative ways. A garden is for all seasons, but it’s always possible to super-charge your landscape for your favorite season. For some people, it’s all about garden beds bursting with summer-blooming perennials (they can put up with barren-looking beds during the dormant season). Plants and trees with red bark. 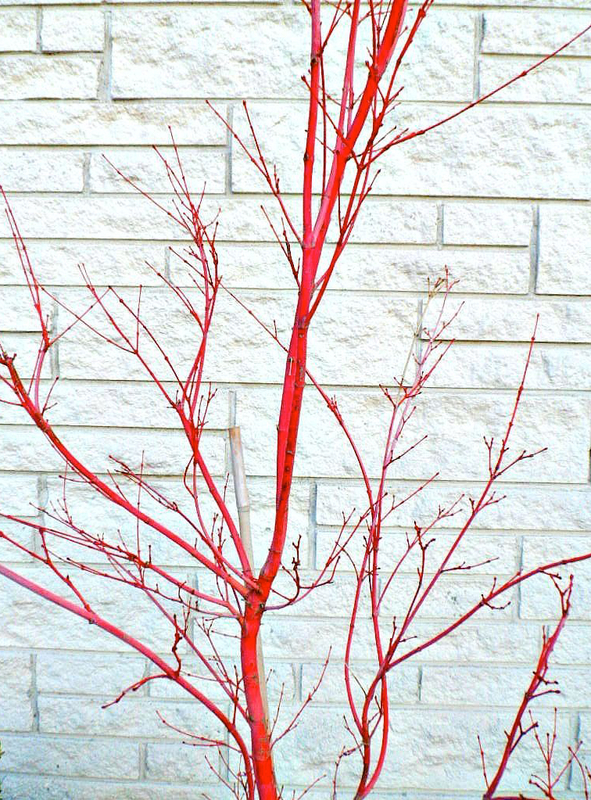 These include the Red Twig Dogwood (Cornus sericea ‘Cardinal’), the Coral Bark Maple (Acer palmatum ‘Sango Kaku’) and the Marina Strawberry Tree (Arbutus x ‘Marina’). 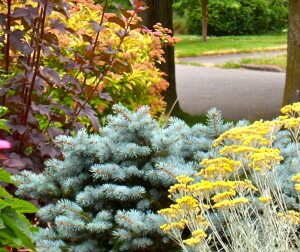 Colorful conifers. Consider the Blue Ice Arizona Cypress (Cupressus arizonica ‘Blue Ice’) and the Dwarf Golden Hinoki Cypress (Chamaecyparis obtusa ‘Nana Lutea’). Trees and plants that bloom in late winter. You might use the Witch Hazel (Hamamelis mollis sp. ), the early blooming Hellebores (Lenten rose sp.) and the Winter Sun hybrid Oregon Grape (Mahonia x media ‘Winter Sun’). It’s a bonus that most of these versatile plants can have a place in any garden. Take a break from the holiday buzz to breathe in the clean winter air and take a look around your garden. Envision where you might like to give your landscape the gift of color. A riotous landscape packed with color and texture stimulates the eye, activates the senses and makes one feel alive. That’s why I like to offer my clients many stylistic options when we start the design process for a new or soon-to-be-renovated landscape. After listening to their preferences, I then see which ideas can be blended into a garden that suits the setting. For a quiet back yard retreat I would make different recommendations than I would for a colorful front yard border for curb appeal. One style element that I enjoy working with is repetition — using masses of single plant or just a few varieties of plants. I find that repetition creates a calming and peaceful effect. And who doesn’t need that after the stresses of a long day? Repetition can take many forms. For a softer, more relaxed feel, I might suggest relying on shades of greens and a soft palette that includes pale blues, white and lavenders. This creates a visual foundation that slows the eye and gives a feeling of groundedness and security. • Mass plantings around a focal point such as a plant, tree or potted garden. This has the effect of creating a foundation for the main event. • Use evergreens in repetition to create structure in the winter garden and provide a backdrop for winter blooming plants and bulbs. • Create solid borders of a single blooming plant, perennial or annual, running along a garden bed or path. This pulls the eye forward to the path’s destination. (Think of a multitude of yellow roses on a wall, or sweeping bands of deciduous grasses. You get the idea.) The impact of a single vision of one color — white Mophead Hydrangeas, for instance — can be at once stunning and serene. Fall is here and it’s time for planting bulbs. Mass plantings of bulbs can be very effective whether they are contrasting colors or a single favorite hue. Since different types of bulbs bloom at different times, you can plant layers of bulbs that will bloom in sequence as spring goes on. Snowdrops bloom as early as January and Allium bulbs bloom in late May or early June here in the Pacific Northwest, taking your landscape right up to the point where summer perennials burst into bloom.